Tony, the newsagents shop you mentioned was probably Stubbs. It was next to Douglas', which was a toy shop, but I'm told also charged batteries. Eden's had greengrocers shops on both sides of the High Road. A couple of years ago a collection of memories was put together by former residents of New Southgate, who knew the High Road and shops well. Simon, If you do a search on this site for High Road, New Southgate, you will see many photos of the High Road shops. There is also a map and list of High Road shops in the "Memories" book. Thank you Colin I will look and see what I can discover. I lived on the corner of High Road and Alexandra Road, above Simpkins furniture shop in the early sixties. I lived in South Road in the fifties. I can remember Simpkins, Stubbs, and the Fish and Chip shop. 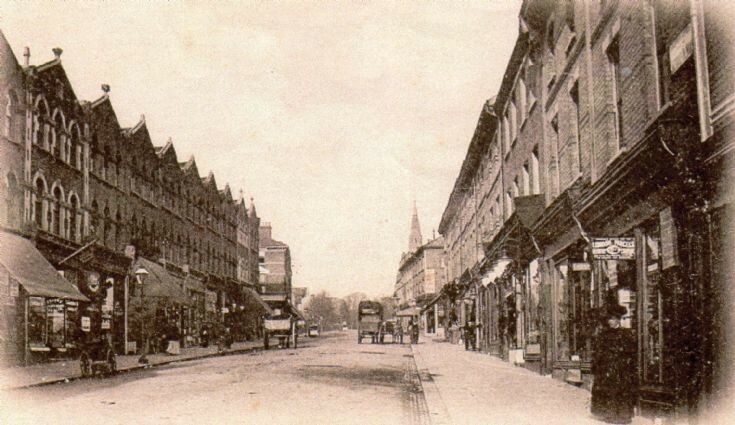 On the corner of South Road and the High Road was Banks the grocers, and opposite side of the High Road was Perks grocers. There was Walters the haberdashers, also in the High Road. My sister worked at Antars, which was on the other corner of South Road, which made men's clip on ties, and the shop sold clothes. Thanks everyone who commented on the old memories of the High Road shopping area. What did any think of the 1970s regeneration of the High Road? It seemed to ruin the area and the community that lived there at the time. Would anyone like to comment on this? I lived above the newsagents shop in the High street in the fifties and also lived in the bungalow in Palmers Road which i beleive is still there. went to garfield Road primary School. We also used to collect Train numbers on the old wooden bridge at bew southgate station, Took me a couple of years before I spotted Mallard. Recently stood alongside this train at Railway museum York. felt tears running down my cheeks to see the old train again. Thank you Colin, Yes that newsagents was called Stubbs. Went to both Cubs and Scouts at the Methodists Church in the high street probably in the fifties. Went back about twelve years ago and the place was unrecognisable. Also sung in the choir at St. Pauls Church. Once again there is a reunion of past Garfield people, and any one who played football for any club in the New Southgate area, or if you lived in or around the N11 area in 40s 50s 60s 70s etc. Share your memories of the past, lots of books and photos to be seen and got. Don't let your memories be forgot. Come along to the Con Club 19 High Road N11 on May 23rd, 12 noon till late, free buffet. Any questions phone 01782 832 535. Lived in the High Rd (52) (nearer North Circular Rd) in the 60's went to Garfield School,went to the cubs. Lived above the Dolls Hospital shop and next to us was the Butchers (Smiths?) on one side and a Sweet Shop (Connews?) on the other, in the same Row was a Radio Rentals shop, a shoe shop and a Cafe (Stayces?) on Lower Park Rd. Gordon, my dad had a TV shop at 56 High Road, could that have been the radio rental shop you mentioned? Yes think that was the TV Shop, my memory thought it was called Radio Rentals for some reason, is that right ? Dont think it was Radio Rentals because I worked for that company years later for over twelve years and would have realised the co incidence. It did sell and possibly rent radios but I so remember going in there and the floor was full of batteries being charged or accumulators.Think he repaired a couple of radios for us.